Roger Staats’ North Idaho Incident Management Team (IMT) began managing these fires June 22 and has an Incident Command Post (ICP) located at the Tanana school. Personnel: 298, including various support/ logistics personnel; Three Type 2 – IA crews; three, Type 1- Interagency Hotshot Crews. Aircraft: One, Type 2 helicopter and one Type 3 helicopter. The Spicer Creek, Tozitna, Hay Slough, Harper Bend, Moose Point, Kokrine, Blind River, and Bering Creek fires are all burning on the AFS- Tanana Fire Management Zone. Saturday’s strong easterly winds resulted in significant fire growth on most of the Tanana area fires, which made direct suppression tactics not only impractical but also unsafe. Conditions were also too smoky to accurately calculate new fire perimeters, so reported acreages will not change until infrared flights allow better mapping. In particular, Hay Slough, Harper Bend, Bering Creek, and Blind River fires all made strong westerly runs (growing significantly), requiring pump, hoselay, and sprinkler placement at two cabins (one near Harper Bend on the Tanana River and one near the Blind River fire on the south side of the Yukon River.) Miners and landowners all around the Hay Slough fire and south and west of the Harper Bend fire are still advised to leave the fire areas, due to predicted continued growth. The Spicer Creek fire moved to the south and west but so far seemed to slow somewhat through a 2005 fire area, as well as in the upper Mission Creek drainage. Southern fingers and flanks on the Tozitna fire (west of Tanana) made pushes towards the Tozitna River. 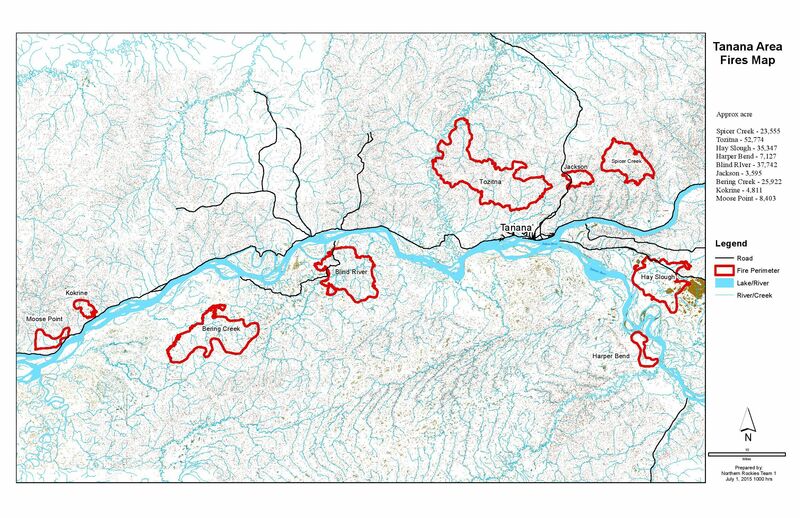 Parts of the central-southern flank of the Tozitna fire also jumped portions of the dozer and hand lines that were constructed Thursday and Friday near the Site Road; however, portions of that flank also seemed to be holding along the western side of Bear Creek. The Moose Point and Kokrine fires showed less growth but continued backing downhill to the south, where crews continued improving point-protection efforts at cabins and a bible camp. As of Sunday morning, the Tozitna fire is still approximately 2 miles north and 1 mile west of the closest inhabited structure along the Site Road. Firefighters will continue improving their existing hose lays, pump systems, and fire breaks around the Tanana community and outlying structures, as variable winds and a warming/drying trend are forecast for today which is expected to result in high fire intensity and spread potential. Fire managers continue to reassess fire activity and management actions based on new fire perimeters and predicted fire growth. Close contact with Village Public Safety Officer, Clinton Wiehl, continues as public and firefighter safety remains paramount to fire operations. Crews up the Tanana River and down the Yukon River have nearly completed structure assessments and will continue providing point-protection for structures as fire growth necessitates. Special Announcements: A public meeting will be held Tuesday, July 7, at noon at the Tanana Community Hall to provide fire information updates. A voluntary evacuation notice remains in effect for the village of Tanana. A dense smoke advisory remains in effect for the Tanana area, with air quality in the unhealthy to hazardous air quality range. For more info: Please contact Information Officers, Jennifer Costich or Steve Till, Tanana school ICP, at 907-987-9835 or NorthIdahoTeamOne@gmail.com. Inciweb (http://inciweb.nwcg.gov) also provides fire information. From the Inciweb homepage, select “Spicer Creek” or “Tozitna” fires from the drop down list at the top right of the page.